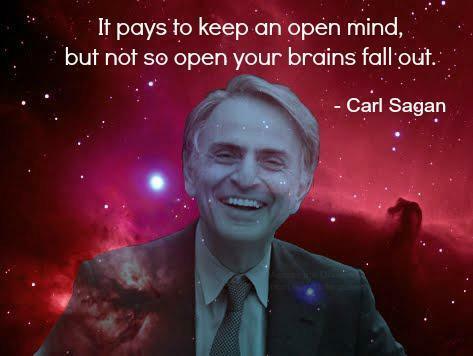 Learning From Carl Sagan | Think! One of the joys I have found in my new interest in science is that it has brought me into what was a previously unknown world of inspiration, enlightenment and influence. As I am exposed to the likes of Neil Degrasse Tyson, Richard Feynman, and Richard Dawkins, I’m gratified that I have been able to bring their wisdom and intelligence into my life, and hopefully just a little bit will rub off somewhere. But one name sticks out above all others. In the last few months, I have been watching the finest television series I have ever seen, a source of wonder and learning for me which I cannot believe took so long to become part of my life. 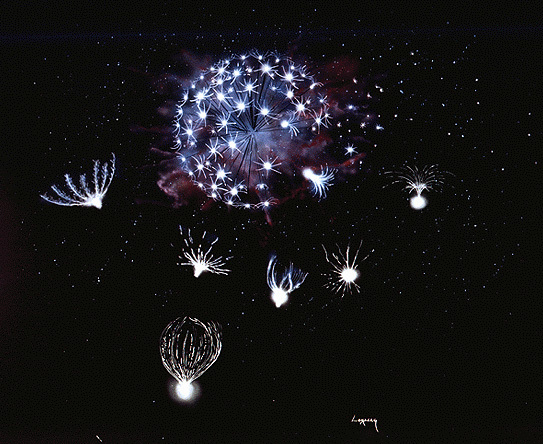 This series is Cosmos, presented by the legendary Carl Sagan. In each programme he leads us on a personal voyage through the history of scientific discovery and the universe, known and unknown. The show is aimed at viewers without a scientific background and not only explains the cosmos around us, but also the achievements of the great thinkers of the past, such as Copernicus, Brahe and Kepler. So as a result of watching the show my knowledge of the universe is increasing, but I'm no cosmologist and I can't claim to understand everything. But there's a lot we can learn from a programme like this even if we don't understand particle physics or string theory. Essentially, in the show, Carl Sagan is a teacher and we are his pupils. Watch the video below to see what I mean. As you watch, you can try and learn about Flatland if you like, but mostly I want you to pay attention to what you can learn from him as a teacher. He's explaining a difficult concept, something many of the viewers will be unfamiliar with. Despite this he isn't at all patronising, treating the audience with intelligence as he diligently and precisely explains the concept. He displays an in-depth knowledge and is not shy about you knowing that he is an authority figure when it comes to this subject. In other words, he is clearly the teacher and we are definitely the learners. While he treats the subject seriously, he is not without humour. He is very effective at breaking up the moments of seriousness with moments of levity. He handles the tone of the discourse beautifully. He is clearly spoken and precise in his language. His ability to deliver a complicated concept in an economical way makes it easier to comprehend. He uses practical and clear demonstrations to illustrate his point, again making the idea easier to understand. He's not afraid of being very explicit in explaining what his point is. His use of language is particularly interesting. He speaks beautifully and yet you never feel that he is talking 'over you'. In fact, I love the mixture of registers he uses, ranging from "the universe is finite but unbounded" to “the only conclusion is that he's gone bonkers”. His body language is open and inviting. He frequently smiles, and you feel more like you're being led on a journey of discovery by a wise uncle then bewildered by overly serious academic. He occasionally uses aphorisms, for example “If you want to know what it’s like inside a black hole, look around”. They act as a form of punctuation, summarising the key points that he has just stated or asking the main questions that need to be emphasised. Phrases like this are memorable for the learners, and will enable them to recall key concepts at a later date. "He displays an in-depth knowledge and is not shy about you knowing that he is an authority figure when it comes to this subject. In other words, he is clearly the teacher and we are definitely the learners." I wonder if some people would argue that it is fine to use videos of athority figures like Sagan, but don't dare play the Sagan in class. And don't wear a tie. Maybe the turtleneck sweater is also a no-no. Would also be interested to read a longer meditation on how a person's brains might fall out. Perhaps I am heading off on the wrong track, but I make a connection in my mind with Allan Bloom's "The Closing of the American Mind." I'm wondering how similar Sagan's falling is to Bloom's closing. Thanks Torn. I wonder if there is a sense that while it's okay to be authoritative when you are a scientist, for us language teachers we have to be a bit more touchy feely. I'm not sure why that has to be the case. I'm certainly not suggesting that we have to be cold and distan, but a little more authority when it's required could be useful, and I think the learners actually respond to it. Thanks for the link to Bloom's book, which I'm not aware of. Sounds like there should be some interesting parallels just from the title. And a turtleneck is definitely a no-no. Thanks for this post, James. I've really enjoyed it and you've widened my cultural knowledge too. References to Carl Sagan would have been lost on me too. Thanks again for something different to think about! Yes Carol, his voice is lovely. I have an audiobook waiting for me which I think might send me off into a reverie whenever I listen to it. That's a great point about how he connected the concept with the knowledge we already have, and I like your parallel with building language on what the students already have. But I don't think I can stretch as far as comparing a language to cosmology, that's just a leap too far I'm afraid!